Didier Drogba has played down speculation he could leave Chelsea this summer. Juventus are the latest club rumoured to be interested in signing the prolific Ivorian, with suggestions the Bianconeri are putting together a £28million bid. 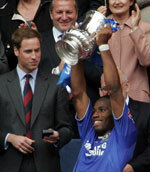 Drogba, who claimed a 33-goal haul last term, is under contract with Chelsea until 2010 and has no intention of parting company with the FA Cup winners just yet. Drogba hinted that he may seek a fresh challenge in the future and would have no qualms about informing Chelsea of his intentions, if and when the time is right. "I am a Chelsea player until otherwise, which is not now, so nobody should start speculating if I will stay or not," Drogba told the Sun. "Where am I going? There has been speculation from the start of the season when I was waiting to finalise my new contract. "When I want to leave I will tell those who are in charge - not outsiders. "At the moment, I am satisfied with what I am doing at Chelsea. "If I disagree with my manager, I know how to tell him."